Another case I came across while researching my book involved five Newark boys who went missing in 1978. In 2008, one of the murderers visited a brother of one of the victims. “He said he’d become a born-again Christian and so he had to tell the truth.” That stood out for me. Murderers often use the fact that they are born-again as a reason why they should be pardoned. I always thought if they were truly born again and repentant they would say the exact opposite. They would say they were ready to pay for their sins. Honestly, I don’t know how anyone can pay for what they did, the truth of what happened is spectacularly horrible, and it’s just so wrong that one of the killers got to live out his life and die of natural causes, but the complete New York Times article I quoted from can be found here (the picture is from the Times article). I grew up in Newark NJ. Long before CSI & Law & Order…I wanted to be a Forensic Pathologist. I’ve always had a deep desire to see perpetrators of crime caught and punished accordingly. I wanted to help catch the bad guys. When my parents bought this case to my attention i was horrified and frightened. How could five teens disappear without a trace? I felt then and now that the initial “investigation” was tepid. They were black and from Newark. Besides their families and friends..who cared? There were three suspects identified but nothing came of it. One died a natural death, one got a small stint in prison with a deal to be relocated upon release and the alleged mastermind Evans was aquitted for lack of evidence. And this happened just recently. By the time investigators who actually cared dug into this case it was too late. This case will always haunt me. I didn’t know them personally but I wept and grieved regardless. The guilty got away, at least as far as man’s law goes. I pray there is a reckoning in that next realm. Not just for the perpetrators of this immensely evil act but for those who felt the boys skin color made them unworthy of a rigorous & thorough investigation from the start. Thank you for including this case, for remembering, for caring. It is a haunting case. And the very sad truth I found, one of the many sad truths I found, was that if you were black or Asian, your case was more likely to go cold. I’m hoping that is starting to become less true, but it was true for the period I was looking at, and since change is slow, I’m afraid it’s probably still mostly true. I have a case where my eldest son and his friend were brutally murdered on Ridgewood ave, In Newark, N.J. on April 29th 2010. No one has ever been charged. 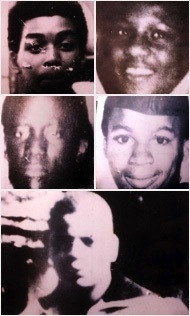 I do not believe that the detectives who were investigating the case even care, because they were two black men. howerer both young men came from good families, with both parents at home.